Aspects of Fernandes’ works which are immediately apparent are its particularly spare aesthetic, bringing it into a proximity with agit/prop, its use of everyday materials and locations, its use of improvisation as a form within installation that brings it close to performance art. 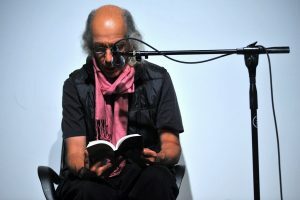 Fernandes’ concern with the relationship between place and improvisation can be observed in the majority of his works over the last twenty years. Fernandes often incorporates contingent aspects of the exhibition situation, invoking the history and terms of site-related art, and making it important to find the locus of Fernandes’ art. Fernandes himself has described the site of his works as being “like a market. . .where we brush up against [the crowd].” In White Bread (1990), a large and ordered display of bread lay on a table or base, arranged slice by overlapping slice (as if) available to the gallery visitor. This scene is of an excess, of a private property guarded on each of its four sides by officious declarations: no gathering, no soliciting, no standing, and, no pets. The inclusion of this last in the series of four signs refuses, by its out of place humour, the possibility of authoritative style. A hybrid site transposed from both the traditional village marketplace and the contemporary supermarket, this site gathers public and private, intertwining them in the memory of a familiar everydayness. Any tendency toward romanticism or exoticism is undermined by the artist’s choice of bread; an urban version, well preserved against the decay its village counterpart would likely suffer through the duration of the exhibition. Through this process or temporal dimension the “mortality” of the body is metonymically present. The stacking of this bread as an art material in an art gallery has another more oblique and more political reference to the administrated availability of food resources within technological society with its automated production and reduction of entities to a supply of bland accessibility without genuine nurturance. Performance’s only life is in the present. Performance cannot be saved, recorded, documented, or otherwise participate in the circulation of representations of representations: once it does so, it becomes something other than performance. Performance’s being, like the ontology of subjectivity proposed here, becomes itself through disappearance. This ontology of subjectivity is manifested in impermanence and is related to the gap that might be thought of as the being of time itself, impermanence and emptiness then being strategies of resistance with respect to any claim to a full or substantive present, a present which could actually only have its being outside time.